Please make reservation at the travel agency. It is also possible to sign up at each of the hotel tour desk after arrival in Guam. If you would like to sign up before arrival in Guam, you can also sign up on this web-site. If you make reservation using free email such as Yahoo and Gmail, our email reply may not reach you. If you do not receive e-mail reply after 3 days of signing up, please check your junk mail folder and trash. We recommended for use by non-free email. We will send confirmation email to your email address above . *Please fill in "undecided" if unknown. As of September 1, 2015 new pick up & drop off location for the Outrigger Guam Beach Resort guests will be available at the Dusit Thani Guam Resort. 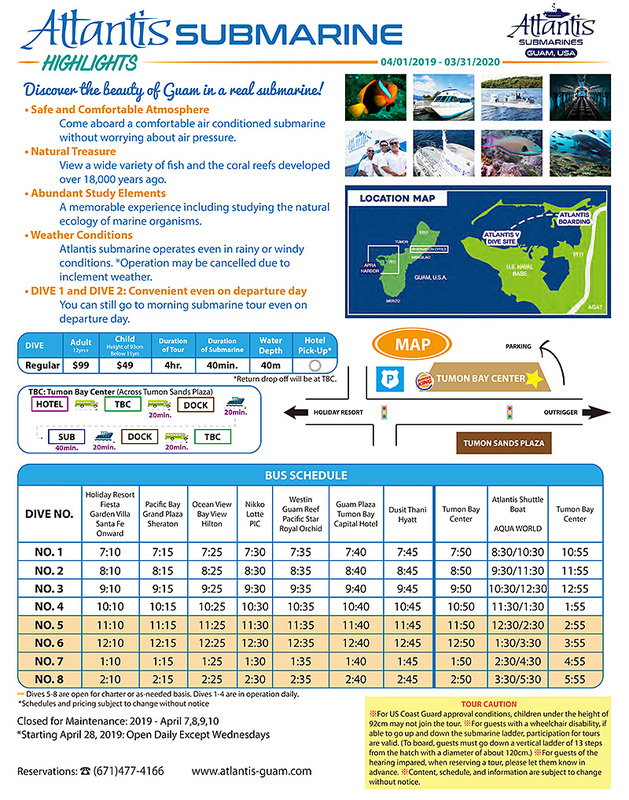 Please check bus schedule to see arrival and departure time of each dive and each hotel. Copyright © 2008-2019 ATLANTIS GUAM, INC, All Rights Reserved.